Restrooms and laundry are located near office. Showers are coin operated (25 cents for 5 minutes). Free WiFi is available near buildings and in some sites. Large, private sites with picnic tables and fireplaces. All RV sites have water, 30 amp electricity, and sewer. Tent sites are either basic or have water and electricity. Campground is open May 1st to November 1st. Check out time is 11:00 a.m. Day visitors must leave by 10:00 p.m. Check in time is 11:00 a.m. to dark. Campfires are out by 10:30 p.m. 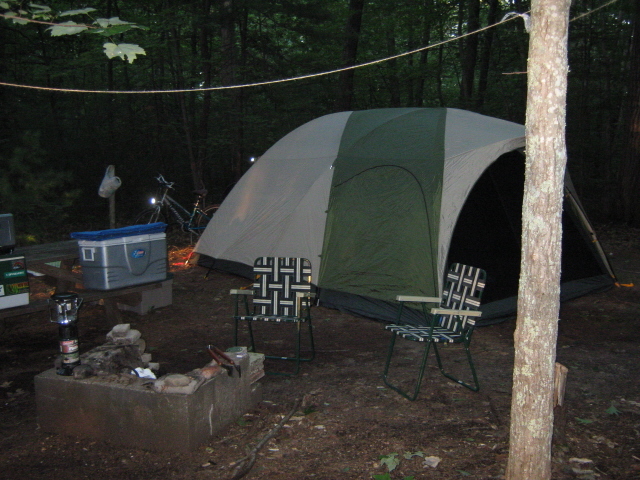 Campground is quiet; we do not permit loud music or other noise. Pets are allowed in RV's only. They must be supervised, kept on leashes when outside, and owners are required to clean up their droppings. Trash and recycling cans are near restrooms. Only one vehicle is allowed per tent site (water and electric and basic). ADDING ADDITIONAL PEOPLE, CAMPING UNITS, AND/OR VEHICLES TO A CAMPSITE AFTER A RESERVATION HAS BEEN MADE OR A SITE HAS BEEN RENTED IS NOT PERMITTED.